Say Goodbye to Clunky Metal Bakeware! As you probably know, metal muffin pans have frustrating drawbacks. They rust, warp, and wear down with use. Stuck-on food is annoying and a nightmare to clean. And then there are the chemical nonstick coatings that eventually scrape off and only leave you wondering if it all went into your food. Finally, a Nonstick Muffin Pan That's Worth It! 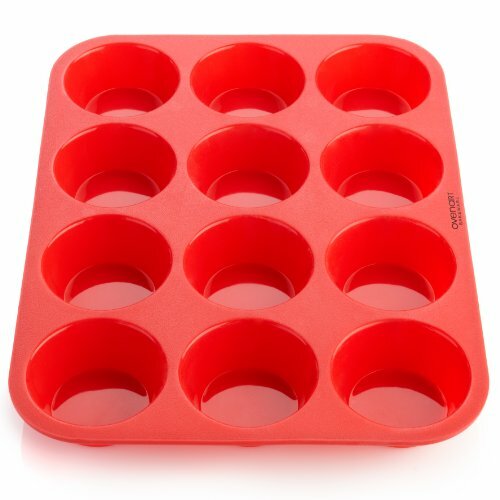 Unlike other similarly looking silicone pans, we make our much loved silicone muffin pan with a European-made, premium grade of pure 100%, high quality silicone. This ensures you'll soon be confidently turning even the stickiest and messiest recipes into delightful muffins, cupcakes, cornbread, cheesecakes, Paleo egg muffins and more. Food will slide out effortlessly and bake perfectly every time using your safe, BPA-free, filler-free, and worry-free silicone bake ware. Our bakeware passes the silicone pinch test because it is filler-free. Nothing wastes time like soaking and scrubbing! You'll really appreciate how easy quality silicone cleans up. The magic nonstick surface cleans with a little detergent and water or you can toss the pan in the dishwasher. With such an easy cleanup, why stop at muffins and cupcakes? Enjoy delicious non-muffin recipes such as taco cups, crab cakes, mini lasagnas, and frozen desserts (it's safe for the oven, freezer, microwave, and dishwasher). New silicone users love the results batch after batch. They enjoy healthy homemade treats and save on store-bought packaged goods. Protected by the OvenArt "Better Bake" Guarantee for lifetime assurance against product defects and performance issues. Get OvenArt today and bake better - guaranteed! Order now, ships today. If you have any questions about this product by OvenArt Bakeware, contact us by completing and submitting the form below. If you are looking for a specif part number, please include it with your message.